A native of South Vietnam, Fr. Hoa was the second oldest of eight children — ranging in age from newborn to 14 — when the communists from North Vietnam took over his nation’s capital of Saigon on April 30, 1975. During that time, at the age of 12, Hoa witnessed communist troops dragging his father away from home at gunpoint. 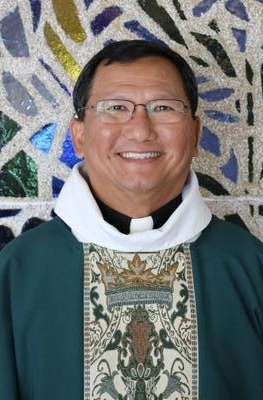 A banker, devout Catholic, homeowner, and former employee of the South Vietnamese government, Fr. Hoa’s father represented everything the communist regime despised. With the head of the household in prison, and with no food, no money, and relegated to a small section of their home now seized by the new government, the family was forced into survival mode. Hoa’s parents had always told their children that they must always be looking for an opportunity to escape the oppression, and likely death, that would befall them if they remained in their homeland. The opportunity for brothers Hoa and Thuan came like a flash in 1979. Thuan, age 17, awoke 16-year-old Hoa in the middle of the night, shouting to his younger brother to follow him. Hoa asked, “Where?” and Thuan shouted “Di My!” “Di My!” (“To America!” “To America!”). Wearing only a pair of shorts, Hoa sprinted behind his brother to a nearby dock, where 42 other South Vietnamese were rushing to board a small fishing boat. Then, after a month at sea, there were shouts of joy on board as some passengers spotted a big ship coming their way. Most dismissed the discovery. Too many ships had come and gone and no one had rescued them. “But when we heard people shout, ‘American flag! American flag!’ and we saw that this was an American ship, we knew we would be saved,” Fr. Hoa said. Many hardships ensued after their Nov. 6, 1979 rescue, but untold miracles unfolded for Hoa and his brother, Thuan. They managed to make it to Covington, Kentucky, worked hard, got degrees, and eventually reunited with their entire family — mother, father, five brothers, and one sister. All are successful, productive members in their adopted nation, where they found opportunities and the freedom to worship God. “I know that we must have strong faith in God and the miracle of life,” Fr. Hoa said. “The mystery of life is beyond our understanding. My experience transformed me and gave me courage to step out in life.